Contrary to what our friends might tell you, we don’t always cook a meal fit for an army. Sometimes, when it is just the two of us, we go the simple route and prepare a dish we can share without worrying about packing up leftovers. 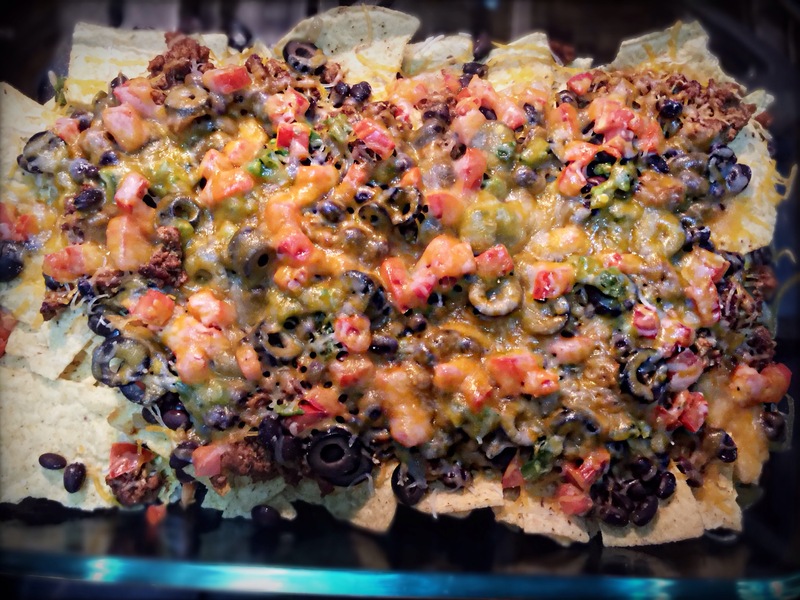 Besides, some meals, like our Nachos for Two, are best eaten immediately. So the next time you are craving something spicy, crunchy, cheesy and just downright delish, try our take on everyone’s favorite Mexican appetizer. Preheat oven to 400° F. While oven is heating, char two jalapeño peppers over a gas flame until skin is blackened, then transfer to a resealable plastic bag and allow to steam for 10 minutes with bag closed. Remove peppers and gently scrape skins off with a knife. Slice in half lengthwise and remove seeds and veins. Dice, set aside. Heat olive oil in a large skillet until it shimmers, about 2 minutes. Sauté onion until translucent, add garlic and cook one more minute. Set aside in a small bowl. In same skillet, cook ground turkey until browned and crumbled. Add taco seasoning and water, bring to boil. Reduce heat and simmer for 4 minutes. Place tortilla chips in a 13- x 9-inch glass pan. Layer turkey, beans, onions and garlic, peppers, olives, tomatoes and cheese. Place in oven until cheese melts. Remove from oven and serve. Nachos may be topped with sour cream and salsa if desired.